Making sure the bottom of your work is smooth (in addition to nice looking and finished) is a desirable thing. 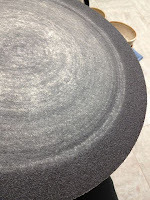 Whether it is a cereal bowl or a vase, it is important that the bottom be smooth to avoid any surface damage to your and your customer's counters and table tops. I see way too many students and other potters that don't pay enough attention to this before they even fire the piece. Start there - clean up the bottom/foot, nice and smooth before you bisque. Use a green scotch Brite pad on greenware - it works wonders. Be prudent regarding any dust. Surface smoothness also depends on your clay body and in my case I use a clay body that gets very prickly when fired. I make sure the bottoms of my pots get a quick inspection before Firing. After the Bisque I check for any unwanted roughness as well. I use a Stilt Mark Stone to clean off any spots that are a little rough. Be sure to wipe off your piece with a damp sponge to remove any dust you may have created. After the final firing check agin and be sure the bottoms are smooth. Use a stilt Stone or try out a pot bottom grinding pad like this one. Made of Silicon Carbide this grinding disc can save a lot of time. Most ceramic supply dealers stock it.